In order to repatriate funds from India, government allow an NRI to open rupee account in any authorized banks of India. For such repatriation, NRI has two options for opening a bank A/c. In order to keep India based earning in India; NRI can open an NRO account in any authorised bank and start depositing India earning in it. Similarly, to repatriate overseas earned money back to India, an NRI has to open NRE account in any authorised bank in India. Both NRO and NRE account can be opened as a saving as well as current bank A/c based on the requirements of an NRI. However, there are also differences which need to be known before opening such bank A/cs. 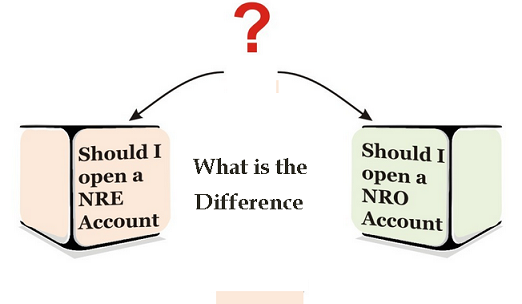 Here are the difference between NRO and NRE account. There is a repatriation limit on NRO account. An NRI can repatriate up to an overall ceiling limit of USD 1 million per financial year. If the source of funds that is about to be transferred is taxable in India then a chartered accountant‘s certificate along with form 15CA and other documents are to be submitted for transferring money. In case of NRE Accounts, there is no repatriation limit. An NRI can freely repatriate his principal deposited amount along with interest from India. Interest received on NRE account is tax free, where as, interest from NRO account is taxable in India. Income originated in India is allowed only to be transferred to interest rate on NRO account. Rent, salary, dividends and other incomes earned in India can only be transferred to NRO account. Such incomes can not be deposited into NRE account. NRE account can not be jointly held with resident Indian. It can only be jointly held with another NRI. On the other hand, NRO account can be jointly held with resident Indian (close relatives) as well as with another NRI. An NRE A/c is for depositing income from abroad, NRO account is mainly for putting Indian incomes. RBI allows Non Resident Indian to transfer funds from NRO to NRE and NRE to NRO account. We urge our Non Resident Indian friends to choose wisely based on their requirements.